Silly us decided to visit Pingxi on a weekend for sightseeing as well as setting a sky lantern! Getting there was pretty straight-forward, or so we thought. Underestimating the crowd, we arrived at the train station only to find out that the tickets for the timing we wanted are already fully booked, so we settled for a later trip. 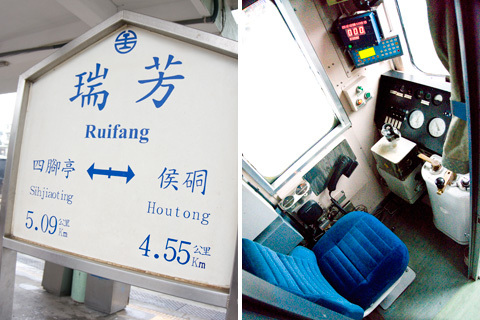 First, we have to take the Western Trunk Line (North) towards Ruifang (瑞芳) station, before switching to the Pingxi (平溪) Line. 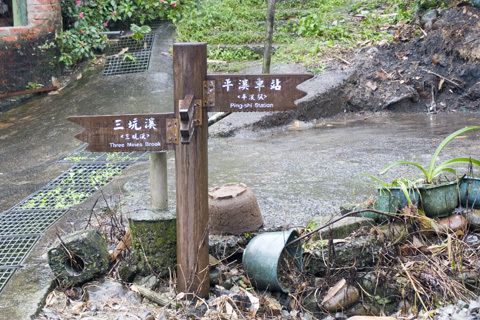 The Pingxi Line runs through both the Pingxi and Shifen districts. 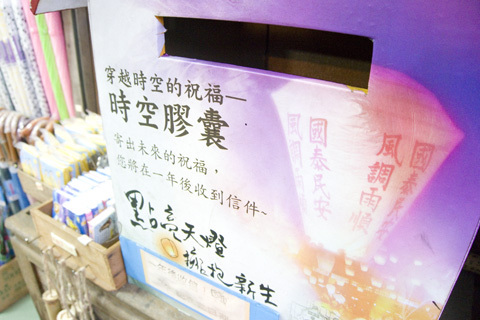 Take note when going to Pingxi (or Shifen) during weekends or on holidays. Even with locals, these destinations are immensely popular and chances are, you’ll be stuck in a massive crowd like us if your visit falls on a non-working day. Happy PigGeeks setting off to Pingxi on a wet, wet day. 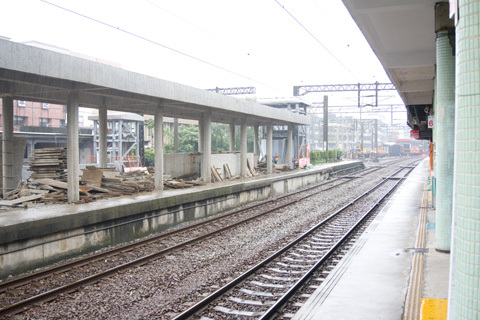 From Ruifang station, we switched to another train. The end of the train was driverless and you can literally take a seat and imagine that you’re the driver for the day. 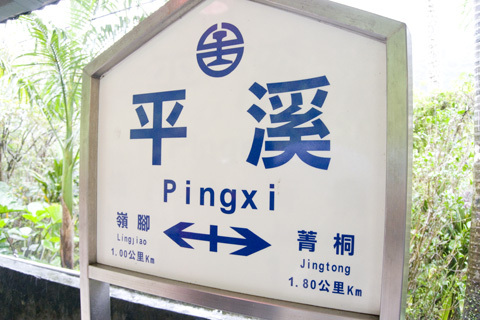 First stop was Pingxi. Not too sure whether it was the non-stop rain that made it seem like the place was a little gloomy. Check out the sign below, stuck in between a mess of overturned or broken potted plants. 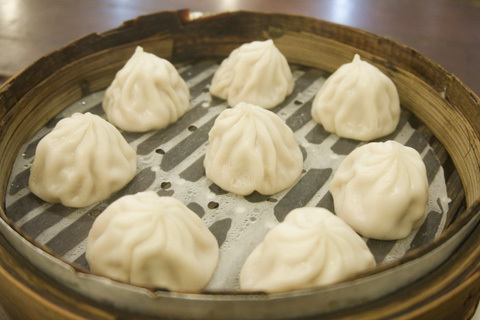 Hey, at least there is still some tasty food to perk us up! 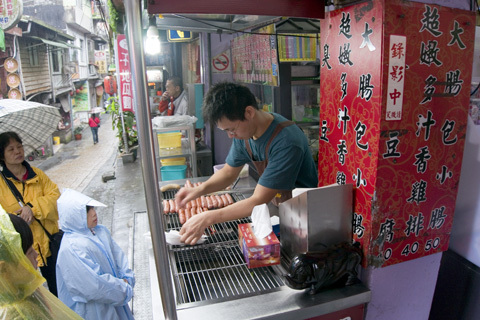 Taiwanese sausage! This guy was doing a roaring business since there wasn’t much to do around here. 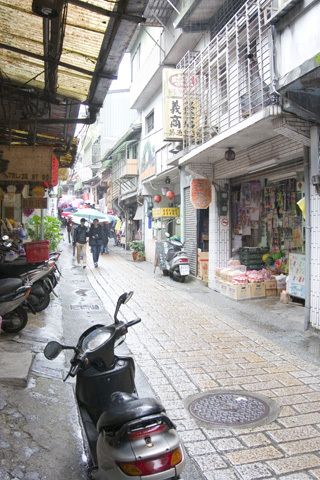 The quaint little alley at Pingxi is kind of a reminder to how Taiwan used to look like, with little shops lining the small walkway. Spotted another shop so we had to try it! 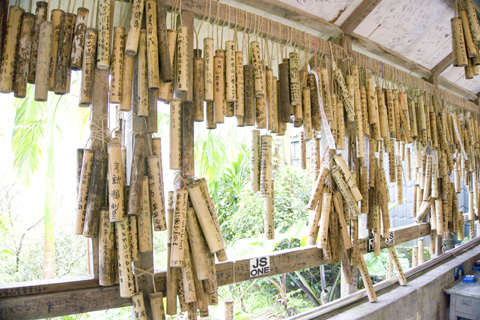 These are little bamboo tubes that you can purchase, after which you can write a message on it and hang it wherever you want! Didn’t hang around much and decided to head towards Shifen. By the way, you don’t see it in the pictures here, but the crowd was insane. The train platform was literally flooded with people – don’t even think of getting a seat on the train. 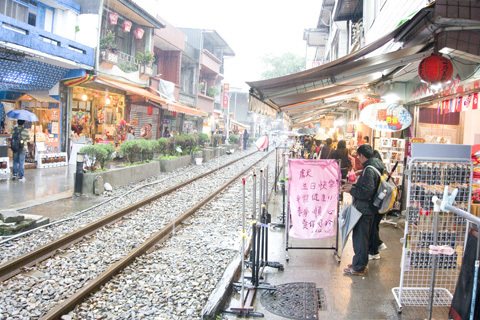 Shifen, in contrast, is much more livelier despite the relentless rain. It was particularly iconic because of the train tracks that run through the middle of the little town. From time to time, a train will pass by so you’ll have to get away from the train tracks. There will be a couple of shops selling sky lanterns and we randomly chose one. 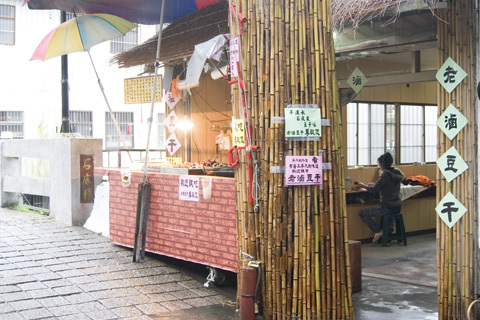 Even with wet weather (as long as the rain isn’t too heavy), you can still proceed to set off a sky lantern here. 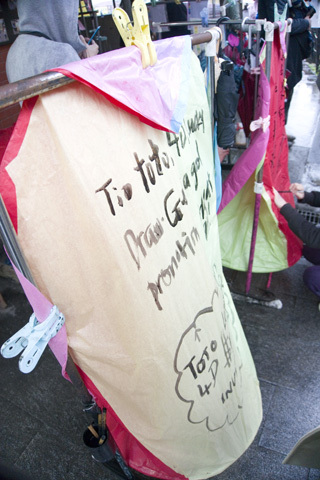 After paying for it, the staff at the shop will clip on the folded sky lantern on their makeshift frame so that you can write tonnes and tonnes of message on it. Finally completed this item on our To-Do list! Tip – Avoid flowing clothes e.g. long skirt. Why? You don’t want to smudge your clothes with black ink, yeah? This shop has a postage service, promising to mail out your letter after one year. Nah, we didn’t try it. Wonder if it works? After many hours of sightseeing and fighting the crowd in the neverending drizzle, we finally settled down in a small little cafe/restaurant to grab a bite. 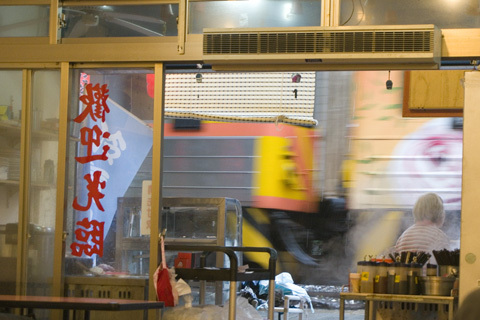 The train was passing by right in the front of the little eatery. 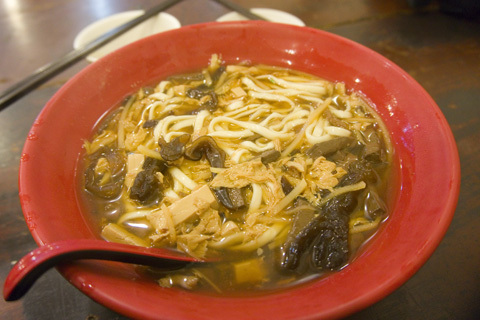 Sichuan Soup. Not exactly spicy by Singaporean standards. 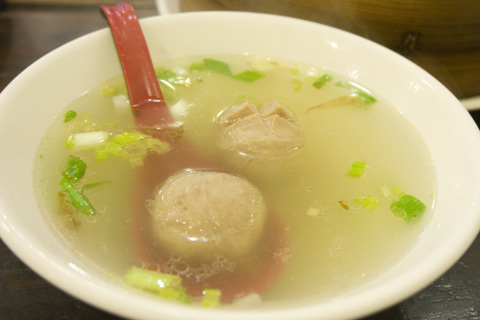 Meatball Soup. No matter how many times we tried this, it still doesn’t seem appealing to us. Thus, our Pingxi and Shifen adventure came to an end and we headed back to Ruifang station, fighting the crowd once again. The rain definitely dampened our spirits a little bit, and we could have done more if not for the rain and the crowd. Next time, perhaps?